If your iPhone (s AAPL) camera roll is filled with thousands of photos, it’s tough to know which ones you’re looking for or share them with others. Viewfinder, an iPhone app created by former Google (s GOOG), Microsoft (s MSFT) and Dropbox employees, wants to make it easier to organize those photos and share and discuss them with others. A new version of the app launches on Tuesday. “We want to be the Google for your personal life,” cofounder Spencer Kimball, who previously worked on systems and web app infrastructure at Google, told me. 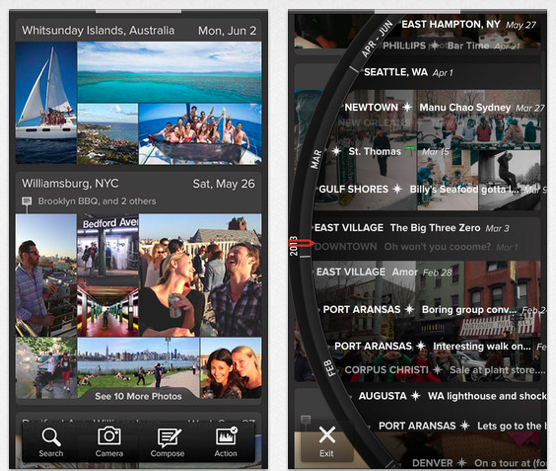 Viewfinder uses photo metadata to sort and organize a user’s photos by time and place. Users can scroll through their photos with a dial or “long-press” the right side of the screen to move faster to a specific time. Viewfinder also lets users share certain photos or collections of photos with specific groups of people and have conversations around them. Viewfinder is iPhone-only for now, though people who don’t have the app — think grandparents, for instance — can view photos in a private library and join in conversations via email. The basic app is free, but there are also two premium versions that let users back up their library of photos in standard or high-quality resolution. Viewfinder Plus, which offers 5 GB of storage, is $1.99 a month, and Viewfinder Pro, which offers 50 GB, is $9.99 a month. In the future, Kimball said that the company plans to let users create printed photo books, which he described as a “tremendous opportunity.” You could do a custom search — say, your friendship with one person — find the highlights of that friendship in photos, and create the book around those photos and conversations. Viewfinder, which is privately funded, is based in New York City and also has an office in Seattle. The company is 18 months old and has 13 employees. The CEO is Brian McGinnis, a former Lehman Brothers executive. Along with McGinnis and Kimball, Viewfinder has two other cofounders: Peter Mattis, a former Google engineer who designed Gmail’s search and storage system, and Chris Schoenbohm, a professional photographer. what a waste of 13 people’s lives.